I hate it when women cry. Especially women that I care about deeply like my mom, mother-in-law, sisters, sisters-in-law, and close friends. Unfortunately I don't have any daughters (yet!) but if I did I am certain they would be included in this group as well. But most of all, it breaks my heart when my wife cries. Especially heart rending is knowing that I made her cry. And through the years I have observed several different types of crying. Sometimes it's something trivial and silly that makes her cry but it has been an unusually taxing day and the tears just flow. Generally she'll begin to laugh through the tears because she can see just how silly it looks to be crying because a pancake is a little overcooked. This type of crying serves the purpose of simply letting the emotions flow. That's it. It's like an emotional pressure release valve that keeps her from exploding like a hydrogen bomb. Another type of crying is from exhaustion. This has been the crying that has most confused me. I remember several times during our first year of marriage where we would retire to bed, read scriptures, pray together, and turn off the light. I would immediately drift into unconsciousness and wake up an hour or two later by sobbing next to me. I would ask what had happened (she had seemed fine before I fell asleep) and she would answer "nothing." "Then why are you crying?" I would inquire. "I don't know. I just needed to." Women and married men everywhere know what I am talking about. Sometimes a woman just needs a good cry. It helps them process feelings--happy, sad, and otherwise--and somehow releases tension and stress from their psyches. I don't understand it, I just know that it works. I expand that to say that God counts all tears we shed that find their origins in pain. Not physical pain but emotional, mental, and spiritual pain. These are the tears we have all shed when someone said something unkind to us, disrespected or insulted us, or flippantly disregarded our thoughts and feelings. The number of times I have done this to Cami is beyond my ability to count. I recognize that I am far less sensitive and understanding than I need to be and I am working on it. Just the other day I was rushing to finish a task at work so that I could come home to my family and my phone rang. It was my beautiful wife. I hesitated knowing that if I answered it would delay my departure from the office. However, I instantly repented and answered the phone. As Cami began to speak I could tell something was wrong. I asked her what it was; she sounded like she was on the verge of tears. She began to tell me about her afternoon and how difficult the children had been, how she had big plans for dinner but was too exhausted to make it and was now failing to make a simple recipe, and how much she missed me and needed a hug. Logically, I took a millisecond to process what she told me and told her I would be home in a few minutes if I could just finish this one task. It came out a lot nicer than this sounds but far harsher than I intended. She apologized, said goodbye, and hung up the phone. I tried to refocus my attention and realized I had blown it. I stood up, locked the office door, and hurried home. When I arrived (it only takes about three minutes) she swore she hadn't been crying but I'm certain she was. Once again, it is especially heart rending knowing that I made her cry. 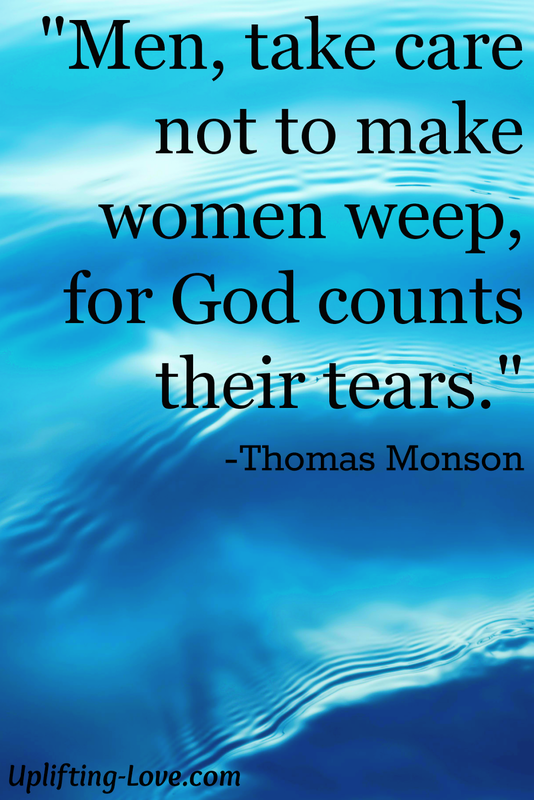 This is the kind of crying that we must strive to avoid causing. While men don't like to admit it we also cry out of pain. It happens to me each time I lose my temper with my family (see my post The Monster is Me). The pained cry is bad. Enough said. While there are certainly many more types and variations of crying for all of us, men included, these are the three that I most often encounter in my marriage. The point here is that not all crying is bad (even though I don't like any of it). But the pained cry is to be avoided at all costs. Let's not cause each other to cry. I am certain someone will be tempted to comment that making your spouse cry is unavoidable and we shouldn't try to avoid it because we're human and we make mistakes. With the fact that we're human I do not argue. What I am saying is that rather than embrace our weaknesses and shortcomings we strive for more. Let's set our sights on the moon. If we fail at least we'll land in the stars. I resolve today to try harder not to cause my wife to shed tears of pain and sorrow. I challenge and invite you to do the same. What Do Sea Turtles & Babies Have in Common?